Oh my, how quickly that callus builds up! 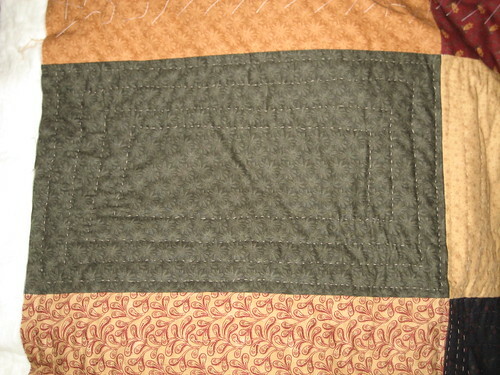 After one seven-hour and one four-hour hand-quilting sessions, I have mild calluses on my left middle and index fingers. Not wanting to go through life unable to feel much on those two fingertips, I’m going to force myself to use the leather thimble. It’s hard. I may switch to a longer needle to see how that works – I’ve been using “betweens,” those tiny little itty bitty things. I need a toddler’s needle. I have six out of twenty-eight panels on Mom’s quilt completed after those two sessions and another three or four hours last night. This is taking quite a long time. I’ve discovered I didn’t baste as tightly as I should have, and the backing is a bit bunched in places, and the centers of all the blocks will probably be bunched, but I just don’t care. It’s the thought that counts. Also, it’s quiet – no whirring of machines. I’m a bit worried that washing it is going to rip it to pieces, though, as I haven’t quite Gotten the Hang of Knots yet. They could easily pull through. All the lines are uneven and crazy, but I think it looks quaint. I should probably get to work on some of the other projects, rather than letting this monopolize my time. Perhaps over the next two days (my weekend,) I’ll be able to get some stuff started and together. I have a list of ideas for gifts that is probably manageable, but we shall see how ambitious I’ve been in my making of plans.